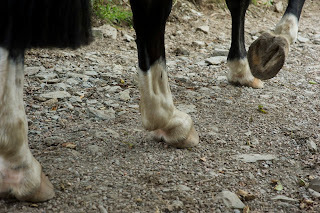 I blogged last week about Minty who came with a mystery lameness. All sorts of diagnostics - flexion tests, nerve blocks, MRI, x-ray and ultrasound - had been tried and none had so far explained the problem. When he arrived he had pretty long feet, as you can see from the photos, but he had a good landing - heel first and fairly well balanced medio-laterally - so it perhaps wasn't too surprising that nothing had appeared on MRI. 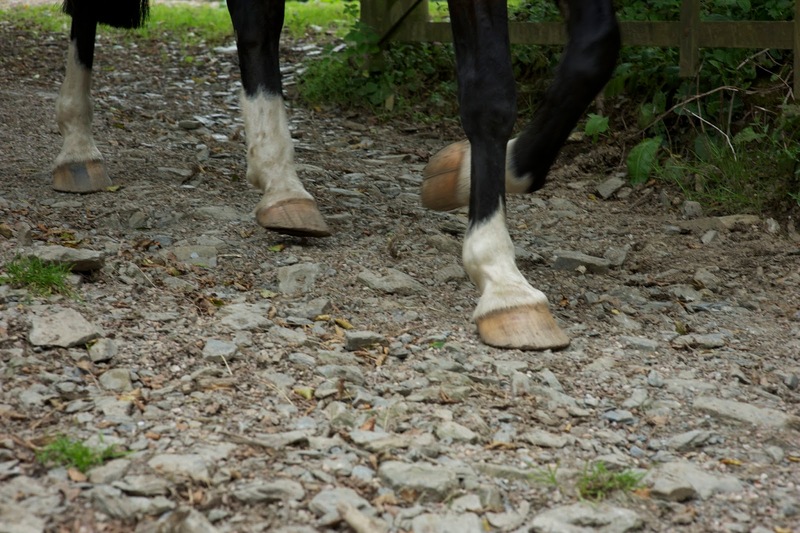 Despite his good landing he was short-striding and pottery, the sort of footiness which is very often related to nutritional or metabolic problems, but that is also fairly common when horses arrive here. Usually once they have been on our forage, feed and minerals for a few weeks this type of footiness gets much better. Minty was no exception and over his first 6 weeks improved steadily until he was looking very sound in the school and really striding out. However he was still finding hard surfaces a challenge and it was at this point that we needed to rule out metabolic problems since even the best diet isn't going to work 100% if there is an underlying metabolic imbalance. Sure enough, a blood test last week confirmed that Minty has PPID (or Cushings) and so he is now on medication which I hope will be the final piece in the jigsaw of returning him to full soundness. 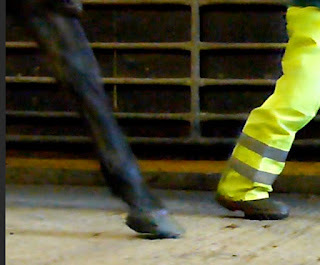 If you have a footy horse, the sensible first step is always to get the diet as good as you possibly can - basing it on forage which is low in sugar and starch and a good mineral supplement (Progressive Earth or Equinatural for preference) - and only adding additional hard feed which is safe for feet (like Coolstance copra or linseed). For the vast majority of horses this will deal with the problem but if you still have a footy horse thats when a PPID test is an essential next step. Its rare that we need to test horses who come here, and over the years most of the times we have tested its come back negative. However if your horse has PPID, treating it can make the difference between banging your head against a brick wall and getting nowhere and having a sound horse. Thats more like it - such a relief to have some sunny days finally this week, after the constant rain of the last 3 months. Its not going to last but we'll make the most of it while we have it! One upside is that the grass looks amazing as its been so mild - I am hoping it will romp away early and we will be able to get a really good haylage crop this year to get us back on track after last year's disaster. Hoping you've all been able to get out and bask in those rays for a few hours - make the most of it, because there's more rain on the way! Instant fix or long term solution? Every day I watch the horses here move and every day I never fail to be thrilled by the sure-footedness and balance with which they move once they have strong, healthy feet. 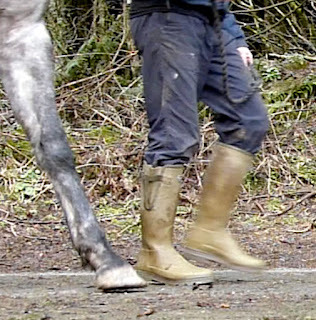 As a rule the rehab horses move less well than our own horses simply because their feet are weaker - they have had long term lameness and are only just starting to become stronger. The horses with incredible feet - Felix and Bryher are the most outstanding examples - inspire me because they move with absolute confidence no matter what the speed and no matter what the terrain. Most (but by no means all) of the horses who come here for rehab have had shoes on for much of their working lives and have correspondingly under-developed feet. 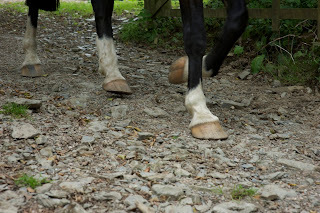 Shoes are excellent as a way of squeezing acceptable performance out of less then perfect feet but they don't make feet stronger; if you want your horse to develop stronger feet then the only way to do it is out of shoes. However, taking the shoes off, while the most visible sign, is only one tiny part in the cog-wheel of strong feet and taking the shoes off a horse on a poor diet will dramatically highlight the problems that previously were minimised by the shoes. 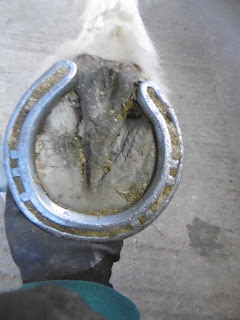 Recently someone contacted me about a horse they had just bought, which was barefoot, and they wanted to know how best to keep it that way; I sent some advice on feeding as of course anyone with barefoot horses would. 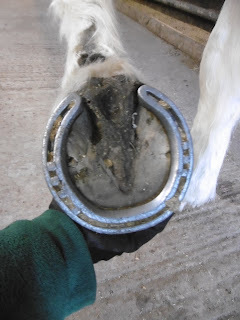 A week later I heard that they had shod the horse because although he was working well he was feeling his feet on tough ground and their farrier advised shoeing, as of course any farrier would! Two different ways of dealing with the same problem - either mask the footiness by using a shoe or solve the footiness by tweaking the diet. Its up to you, and it all depends what you want in the long term. The weather so far this winter seems to have consisted of fog + rain, wind + rain, gales + rain and hail so its a relief that and its finally over the last couple of days decided to stop doing most of those things; the sun even came out briefly - may there be plenty more in the days to come. Anyway, it got so bad earlier in the week that I decided not to even attempt photos or video but as of yesterday I reckoned my cameras could probably cope again, so here is a slightly belated 4 week update on Minty. He arrived in shoes with a mystery lameness and on video was landing flat and on the lateral edge on his worse foot, which is this left one. His feet were very long and you can see he has already grown out the nail holes despite not being trimmed at all. Straight out of shoes he had lots of false sole and a rather weedy frog, as you can see. Now his frog is much better already and he can land heel first and with the sole exfoliating naturally from walking about on the tracks he also has better concavity (you can see the last of the false sole still there at the apex of the frog). His frog and palmar hoof are building up nicely but Minty is more short-striding than one would expect one a tough surface so he will be having a blood test for PPID next week. This is something that our vet and I often do once horses have been here for a few weeks if they are not becoming more comfortable despite being on a safe diet. In fact the rings on his feet suggest that he has had some nutritional or metabolic challenges in the months before he came here so it will be helpful to know whether there is an underlying metabolic issue. If so, there are some good treatment options which should make a big difference to his comfort levels. Again this foot in shoes had a weak frog and once the shoe was off the dead sole was clear to see. As with his left foot, its now mostly gone with no need for trimming. He has some longer medial wall left on both feet which will also go in the next few days but its not causing him any problems for now. Apologies for the less than brilliant quality of the last photo - I'll try for a sharper shot next time! Apologies for the lack of updates over the last few days. As any of you in the south west of England will know, we have had incredibly bad weather and are now in the middle of gale force winds and torrential rain. We should be used to it as its been like this since November but it makes for impossible conditions for filming and difficult conditions for photos. We're all fine and the horses are coping admirably with the weather and fortunately its still possible to work them but you may not get much in terms of blogs this week - lets see how things go! Time for Finnick's update, a little late because of the atrocious weather which has yet again made photos and filming tricky. I've not uploaded his feet shots because they were just too dark to be useful - I will have to take some more later but for now here is his video footage and stills. He didn't have a bad landing on his RF when he arrived but his LF was weaker - thats his worse foot. The still is of his LF landing and as you can see he was toe first on that side. Fast forward just over 3 weeks and his landing has normalised and is now basically the same on both sides. Now to improve it further and build up that palmar hoof, along with getting him to use himself more evenly - lots to do! Finnick landing from Nic Barker on Vimeo.